It was a Monday night & I was looking forward to a nice bimble round the upper section of HLIS showing the newer club members the delights of this cave. Scott had other ideas and had come prepared for a descent of the pitch. 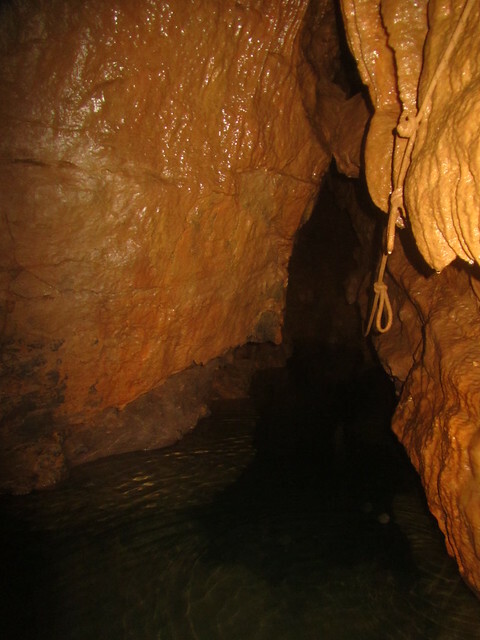 The cave was actually quite dry (ish) and there weren't too many midges at the start which was nice. Someone (me) had issues locking the lid, so Jon had to head back up the ladder to show me how it was done. I am one of those people who struggles with simple field gate catches.. 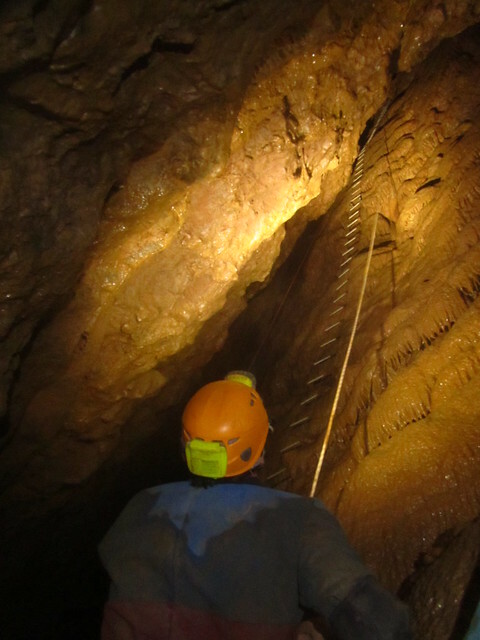 The descent into the cave went without hitch with the usual warnings of watch the scaffolding, stay low in the pretty sections & don't tug too hard to the rope leading up the short climb. Once at the top of the pitch Scott rigged it, whilst Sarah told us how much she hated ladders. Jon decided to explore the rest of the cave whilst we went down the pitch, he agreed to wait for us on his return at the top. I've been down the pitch, but had forgotten what it was like. I have also had quite a bad phobia of heights which is more in control than it used to be. As I got half way down I struggled to get my foot onto the ladder rung, and nearly fell off the ladder trying to find it (we were using a lifeline, but I didn't especially want to be fall off it) I've not fallen off one before, and thankfully didn't after the others spotted me struggling and pulled the ladder away from the wall so I could get a foot back on. Probably should have underestimated the depth of the pitch..
After that it was the fun traverse over the beautiful blue pool, and a quick scoot to the top of Broon Ale Boulevard for Scott and Sarah whilst Tim and I waited at the bottom. Once they'd had enough exploring we headed back to the climb where I ascended 3 times the speed of the way day & was relieved not to have struggled. We met back up with Jon & Jon and I headed on out whilst the others packed down. I introduced Jon to the wonders if the cave life (various moths & a white spider) on our way out. I managed not to embarrass myself for the second time and got the gate open without hitch. Despite the wobbles the bottom of Pewter Pot is a fantastic cave view and another side to this fantastic cave. Sorry for the lack of photos of the formations, I've posted some in a previous report.